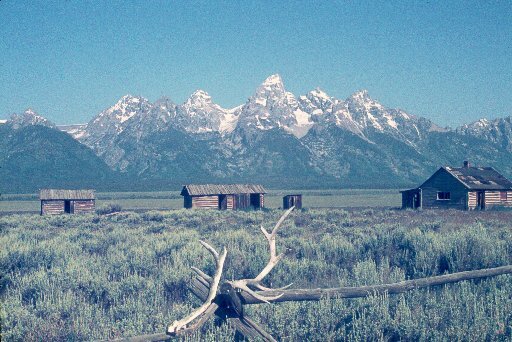 A movie set in Grand Teton National Park. It's been reused numerous times. In the summer of 1965, having just finished Geology 101 at the University of Wisconsin, I landed a job as a geologic field assistant. I spent the summer in the Thrust Belt of western Wyoming, eastern Idaho and northeastern Utah. I was assisting Lloyd Furer, who was finishing his field study for his PhD dissertation on the "Upper Jurassic and Lower Cretaceous Non-marine Sediments of the Thrust Belt". In other words, the Morrison Formation/Group (depending on which state you were in). It was my first trip west of the Mississippi River. We camped most of the time, even sleeping under or on top of picnic benches in city parks, or often just out under the stars in the sagebrush. It was quite an adventure!